From the humble start in 2000, XMT, currently managed by a strong group of professionals and experts from both Malaysian organisations and multi-national companies, is driven with the aim of growing its business in ICT Systems, Telecommunications, ICT Infrastructure, and Oil & Gas sectors locally and abroad. XMT is a members in good standing with these various associations because XMT has one aim in mind – to deliver tangible value to help our clients operate their businesses efficiently and compete effectively with products and services of the highest reliability, security,and efficiency. In 2016, XMT has been identified as one of the TERAS companies (High Performing Bumiputera companies) and granted by the Malaysian Government to expand their high-potential business globally based on merit, with the overall objective of enabling XMT to contribute significantly to Malaysia’s GDP by 2020. 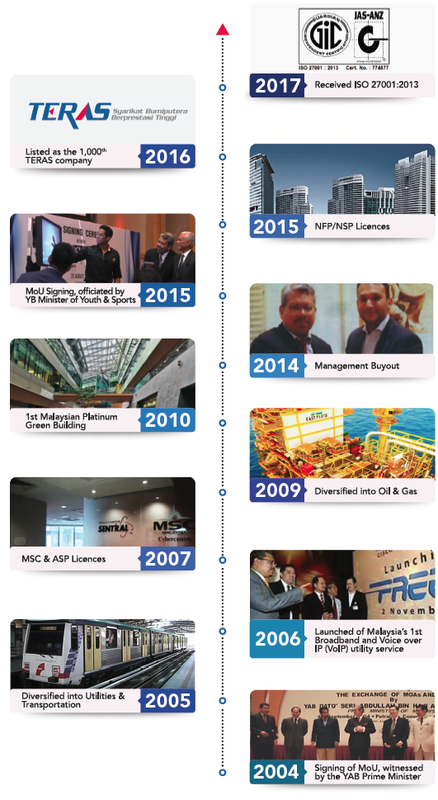 XMT grew into a standalone entity and is now classed as one of Malaysia’s strong industry leaders in Telecommunication and ICT services.